Ernest Van Maurik, known to all simply as ‘Van’, joined the illustrious Artists Rifles regiment in the Territorial Army in 1936, but when war broke out he was commissioned into the Wiltshire Regiment. In the summer of 1940 the regiment was posted at Folkestone to defend the South Coast in the event of an invasion, during which time he undertook a course at Hythe Small Arms School and found himself involved with the SOE, the Special Operations Executive. This led to him to Scotland, first to the Commando Training School at Lochailort and then to Arisaig, where he became responsible for helping organise resistance to the Nazi regime in occupied countries. This involved the training of prospective agents in small arms, demolition and other special forces activities. At this time, he helped train a number of Czech soldiers who went on to participate in Operation Anthropoid, the assassination of SS-Obergruppenführer Reinhard Heydrich in Prague. Van was then transferred to the SOE’s headquarters in Baker Street, London. There he was to work for notable figures such as Maurice Buckmaster and General Colin Gubbins. He also got to know a number of individuals who were to become famous agents, people such as Peter Churchill, Odette and Yeo-Thomas (‘The White Rabbit’). His main work was to get agents both in and out of Occupied France – but then it was his turn to go into the field. Van was initially sent to Malta to help with the dropping of agents into Yugoslavia. His next mission was to Switzerland – via Occupied France – to assist SOE agents in France and also deal with couriers from F Section SOE who used Switzerland as a channel for communicating with London. After many adventures, Van reached Switzerland where he carried out his task until the end of the war in Europe. He then was involved in assisting the investigation into the fate of the many SOE agents who had been captured by the Germans and were still missing. The son of a Dutch father and English mother, Ernest Henry van Maurik was born on 24 August 1916. He grew up with a natural facility for languages and left his schooling with a strong grounding in French and German. Called up on 2 September 1939, he was initially commissioned into the Wiltshire Regiment. 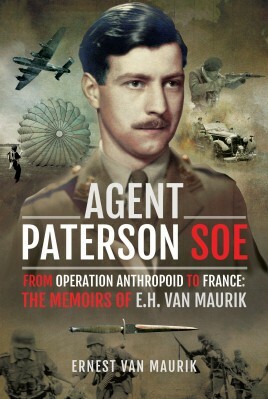 In time van Maurik was sent to the Commando Special Training School at Lochailort from where, having proved adept in the techniques of special operations and sabotage, he was sent as an instructor to the SOE training school at Arisaig. In 1945 he married Winifred Hay, who had been his FANY secretary at SOE’s headquarters. On demobilisation, he joined the Foreign Service. After the war, the British made Van an Officer of the Most Excellent Order of the British Empire. The French, meanwhile, made him a member of the _Légion d’honneur_. He died on 21 January 2012, aged 95.